BEFORE ANY CALL IS MADE, IT WOULD BE PRUDENT TO LOOK AT THE FOLLOWING EXCELLENT LINK TO THE BRITISH BEEKEEPERS ASSOCIATION WEBSITE WHICH WILL HELP ALLEVIATE ANY FALSE IDENTIFICATIONS. 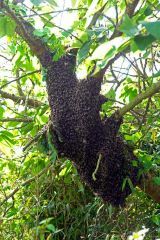 If a settled swarm of bees are seen by the General Public in Guernsey please call Damian Harris on 07911 721785 who will deal with it or transfer the details to another swarm collector. If any new members of the GBKA who think they need help in the future with a potential swarm from their own apiary, it would be advisable to organise a bee buddy well in advance.